Burned out doing too much in 2016, I’ve rejuvenated and assessed my limits. It feels like 2017 is just kicking off, yet here we are at the end of January. Time sure seems to be getting away from me lately. I blame the the heater skelter of the holidays and uncomfortable weather. Well, and taking a not so great vacation didn’t improve my mood any. I got sick and all else fell to the side. Today is my opportunity to change that. Today is for LEGO! Before I dig into this year, I need to talk about the last one. November and December ended up being prolific months—in sharp contrast to January. From Thanksgiving to Christmas, I published sixteen new LEGO renders. They ran the gamut of creations: new stuff, old stuff, original stuff, trying out new things, recreating old things. It was fun. I attribute my spurt of creativity to a couple of things. First off, I needed to take time off, so a lot of this was filler from not having to work. Often I fill that time with movies or video games. That is a habit I’ve been trying to curb over 2016, leaving me more time for creativity. Second, the tools at my disposal allowed for faster creation. Although there was a sense of charm using POV-Ray to position bricks and create scenes using scripts, it took time. Changing my workflow to use Mecabricks allowed for faster builds. Using Blender reduced the hour I would spend with POV-Ray adjusting position and lighting to less than 10 minutes. I produced more, and my flickr account attest to it. 2017 rolled in, I burnt out. As the year closed, I ran into a different problem. I blogged five of my renders, but the rest just sat. I had all these fun creations, but I wasn’t motivated to blog about them like before. It wasn’t that their stories weren’t there—I just didn’t care. Although it bugged me, it was a struggle to write. And, in the end, I didn’t. Instead, I published my stable of renders, one of which the Brothers Brick blogged. I grew my Flickr friends. And I ran. Did I mention I was a runner? Yeah, great group of people and lots of fun. But it too was taking up time and energy. Another reason not to write. As 2017 rolled around, I was done. For the most part, I stopped writing, I stopped building, and I almost stopped running. A much needed vacation ended up being more stressful. So, it wasn’t until my wife and I settled back into our routine that my motivation returned. But you know what? It’s okay. We all over reach at times. We test our boundaries. Sometimes we break through, and other times we regroup and assess. As my adult children went back to their lives, and the snow tried to melt, my energy and motivation returned. I love me some emoji. Which brings us back to today. Today was a motivating day. As an early riser, I generally get a few hours in the morning to myself—excepting the three dogs, of course. I woke up with a desire to do something, so I did. At the end of the year, I had pulled out my LEGO bricks for the kids during a holiday party. To no one’s surprise, I quickly found myself building along with them. 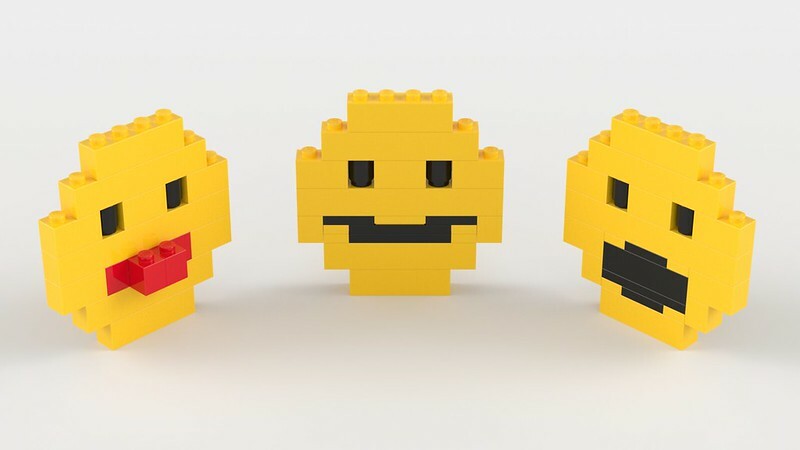 Among the few things I built that night were these three LEGO Emoji. As proof that I don’t only render LEGO, I took a picture of them this morning. From left to right, they are Sticking Tongue Out, Smiling, and Wow faces. 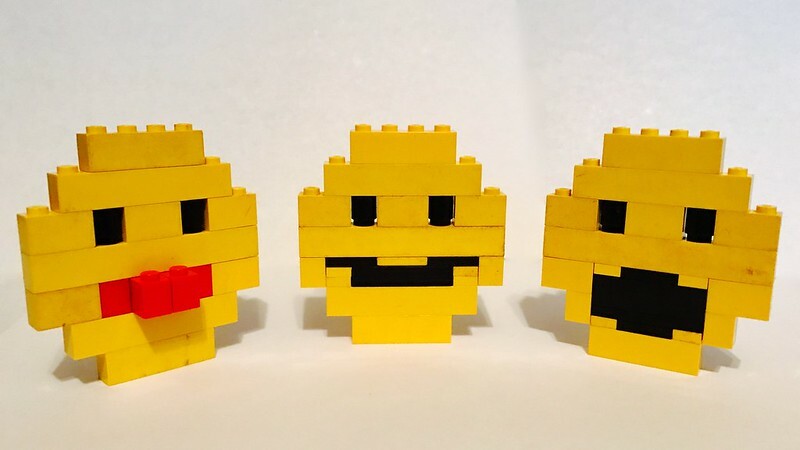 The LEGO bricks used in these models are over 30 years old—dirty and grimy from years of play. Although more authentic than the pristine renders, I still wanted to share the models. I took the time to recreate them in Mecabricks and generate a clean render of them. Here is the result. It’s never too late to start the year. And with my first render under my belt, 2017 is now underway. My boundaries pushed too far, I was forced me to take a breather. With that behind me, I can now go back go back and tell the stories behind those other 11 renders I published. As a bonus, I have a few more renders I didn’t upload to share. This time, though, I’ll take it a bit slower. No need to burn out twice.